Krešimir Ćosić (November 26, 1948 – May 25, 1995) was a Croatian professional basketball player who represented Yugoslavia internationally. He was a member of FIBA Hall of Fame and Basketball Hall of Fame. He was also a notable church leader and missionary of The Church of Jesus Christ of Latter-day Saints, sometimes casually called the Mormon or LDS Church. Ćosić was born in Zagreb, Yugoslavia, and raised in Zadar, where he started his basketball career in 1965, playing for KK Zadar. 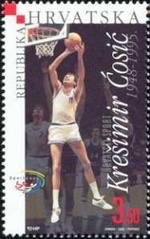 He came to the United States to play college basketball at Brigham Young University from 1971 to 1973. Ćosić converted to The Church of Jesus Christ of Latter-day Saints while he was at BYU, and later served as the LDS presiding priesthood holder in post-communist Croatia. He was baptized by Hugh Nibley, one of the LDS church's most celebrated scholars. Ćosić also introduced the LDS Church to Yugoslavia. He translated the Book of Mormon and Doctrine and Covenants into Croatian. Ćosić was the first foreign player to earn All-American honors from the United Press International (in 1972 and 1973). After his college career, he rejected several professional offers and returned home to Yugoslavia. He played in four Olympic Games: 1968, 1972, 1976, and 1980. At the 1980 Olympics in Moscow he led his team to the gold medal. He previously led Yugoslavia to a pair of World Championship gold medals in 1970 and 1978. Ćosić then turned to coaching, and he led the former Yugoslav team to a silver medal in the 1988 Olympics in Seoul and two bronze medals at the 1986 FIBA World Championship and 1987 EuroBasket. In 1996 Ćosić became only the third international player ever elected to the world's Basketball Hall of Fame in Springfield, Massachusetts, the birthplace of basketball. In the years following basketball he worked in the USA as a Croatian diplomat at the embassy in Washington, D.C., having helped secure the land where the embassy now stands. Ćosić died in Baltimore, Maryland in 1995 of non-Hodgkin's lymphoma. On March 4, 2006, Ćosić became just the second men's basketball player to have his jersey retired by BYU (the other was Danny Ainge). In 2007, he was enshrined in the FIBA Hall of Fame. The Croatian landmark formerly known as Califfi Castle now carries the name of this basketball star and Churchman. There is a square in Zagreb, Croatia that bears his name (Trg Krešimira Čosića). 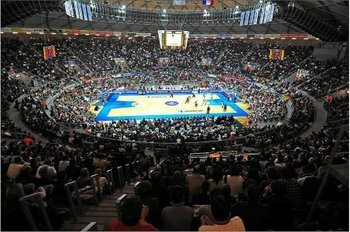 Krešimir Ćosić Hall is the third largest arena in Croatia. Yugoslavia recognized The Church of Jesus Christ of Latter-day Saints as a legal entity in 1975. In the same year, Church leaders formed Yugoslavia's first Latter-day Saint congregation in Zadar. Between 1993 and 1998, the Church provided thousands of tons of food, clothing, bedding and medical supplies to Croatia. Since 1995 the Church has participated in a project to assist Croatian farmers. Currently there are just over 500 members in six congregations in Croatia. This page was last edited on 12 September 2011, at 18:12.